We have driving lesson gift vouchers available starting from as low as just £18.90 per lesson. Driving lesson gift vouchers are the perfect way to get your loved one, relative or friend started on the road. Or if they are already having driving lessons, gift vouchers are the ideal present to help share the cost of lessons. 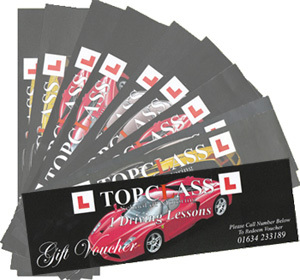 Why not treat your loved ones to a Topclass Gift Voucher towards their driving lessons? Once you pay for your gift vouchers you will receive them in the post within 2 to 3 days or if you require your vouchers sooner we can deliver them to you in person. Each Topclass gift voucher is worth 1 hour of driving tuition. When you call to redeem your vouchers you will be allocated an instructor, all you have to do is give your driving instructor the amount of gift vouchers depending on how many hours you are doing on each lesson. This way you can keep track of how many lessons you have used and how many you have left. Call or email us now to order your Gift Vouchers today.